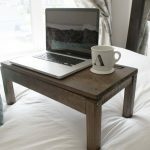 How’s this for full circle: I am writing this post as I sit in bed, with my laptop open on my newly-built folding lap desk. DIY just makes life better, amiright?! This folding lap desk is definitely making my life better rightthisverysecond. In short, my thighs aren’t EN FUEGO. 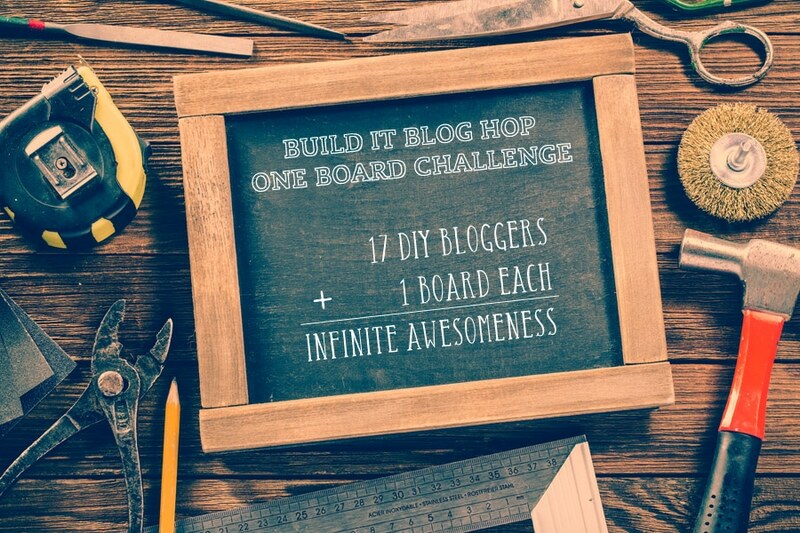 Okay, so here’s the dealio, you guys: I challenged 16 of my builder blogger friends to build something awesome out of a single 1×8 8-foot board. 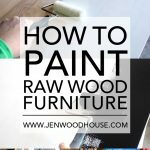 It made for a fun blog hop and a challenge that made us all stretch our creative muscles and think outside of the box. Of course, I had to participate in this super fun project, right? Right! Except for weeks and weeks, I racked my brain trying to come up with something to build and for weeks and weeks, I kept coming up empty. So I went back to where I always go when I find myself creatively parched: necessity. It always comes down to necessity, doesn’t it? Behold: this folding lap desk was the perfect solution. 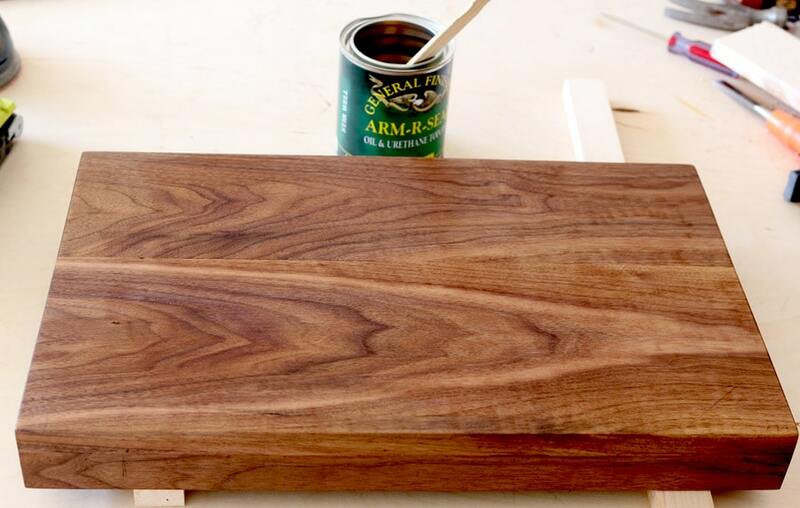 Because I was purchasing just one board for this project, I decided to splurge a little so I picked up a drool-worthy piece of black walnut from a local lumber yard. It cost me a little over $40 which is steep, I know, but hey. It’s black freakin walnut. Please tell me you understand. Click here to download the PDF plans for this Folding Lap Desk. First, I cut all of my pieces out of the 8-foot board. The cut layout is included in the plans. For the top, I joined two pieces of the board using biscuit joints. You may notice the two boards aren’t the same width. I ended up ripping a little bit off one board because I wanted my top to be just 13″ wide, instead of the 14-1/2″ width that’s written in the plans. If you don’t own a biscuit joiner, that’s totally fine. The biscuits just help with alignment. You can also just use wood glue when you’re joining long grain to long grain. 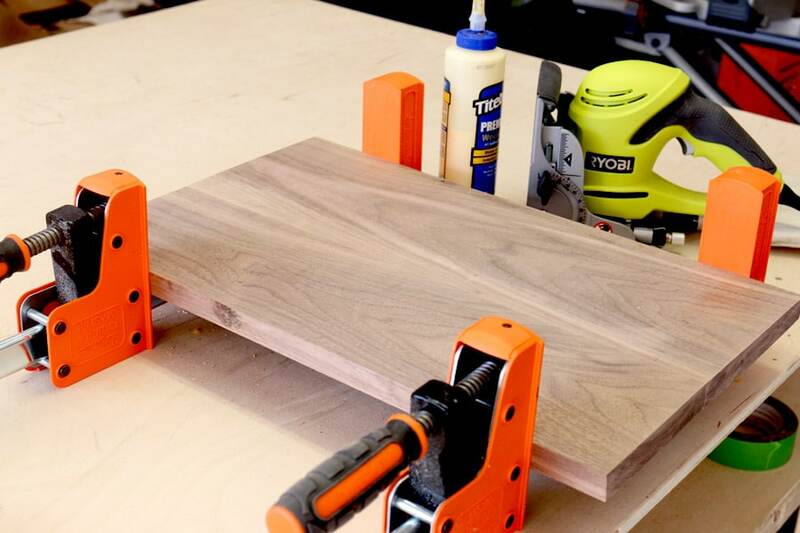 You’ll just need to make sure all the surfaces are properly aligned, then glue and clamp the pieces together. *This post contains affiliate links. To read my full disclosure policy, click here. This is the biscuit joiner I own. 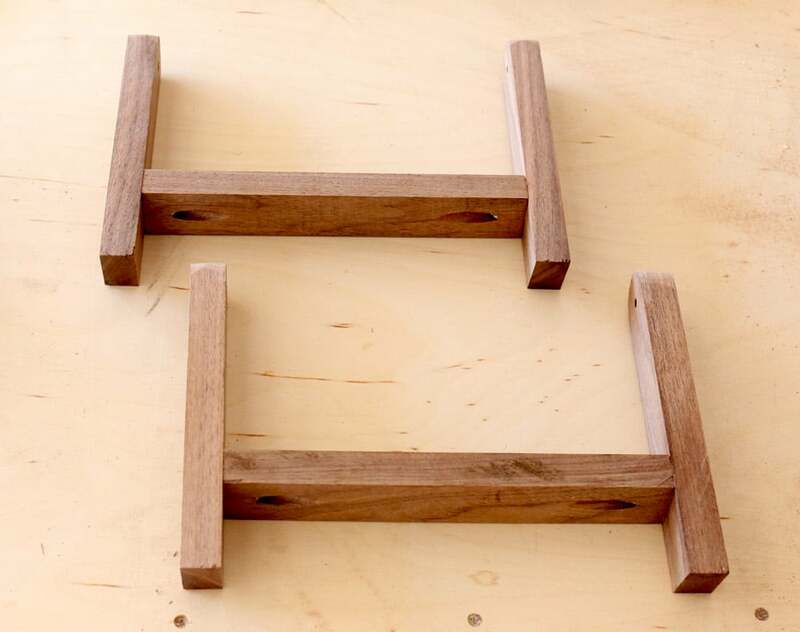 I use this wood glue and these parallel bar clamps. After the glue dried, I attached the aprons to form a tray. Again, I used biscuit joints, but pocket hole joinery would work well here too. Then, I constructed the legs. I rounded the legs at the top and cut the bottoms at a 15º angle then attached the stretcher with pocket hole screws. This is the pocket hole jig I own and don’t build without. Have you guys ever used this Arm-R-Seal stuff? 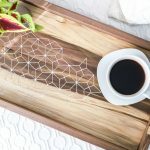 I just discovered it, thanks to one of the woodworking friends I follow on Instagram and it’s heart eyes all over the place. I just love how it makes the wood grain come alive. After sanding with 180-, 220-, and 320-grit sandpaper, I wiped each coat on with a soft cloth, sanding with 400-grit sandpaper in between each coat. Here is a great finishing technique video. Who am I? I’m the girl watching woodworking videos on Youtube. 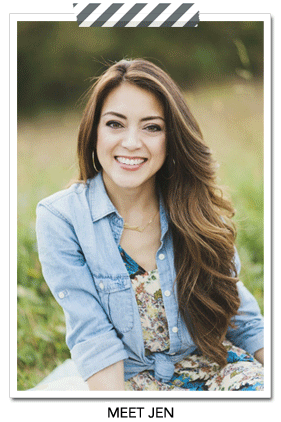 I’m the girl hanging out in woodworking forums, getting excited about wood grain, joinery, and different wood species. Oh my goodness, what in the world?! 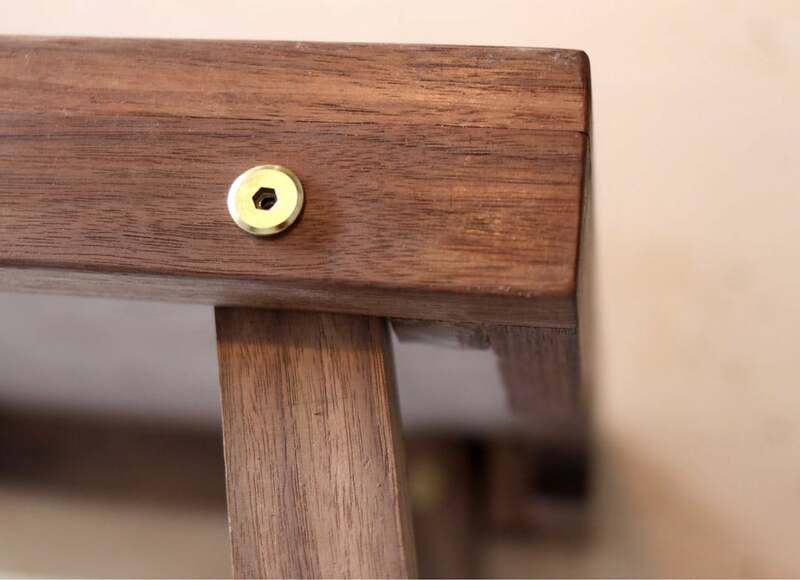 Just as I did with my West Elm-inspired Butler Stand, I used these connecting bolts and caps to connect the legs to the top. You’ll need to drill a hole big enough to fit both the cap and bolt. I used a forstner bit because I like how clean and precise the cuts are, but a spade bit will work here too. 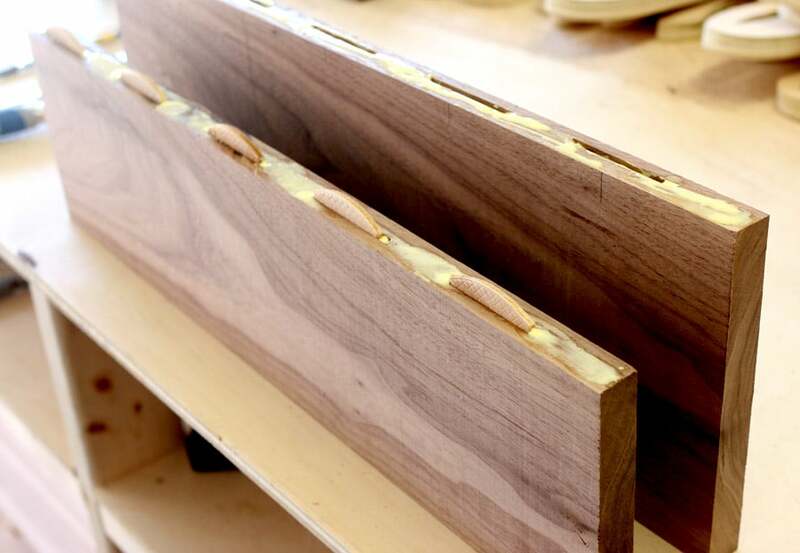 A spade bit will cause a bit of tear-out so I wasn’t taking any chances on marring this beautiful black walnut. 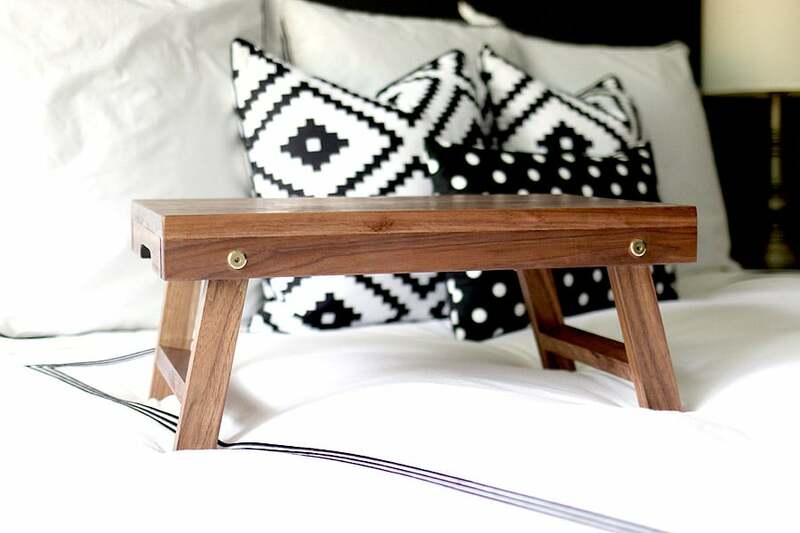 The legs neatly fold in for simple, space-saving storage. Well, this is embarrassing. I feel like you caught me with my pants down. 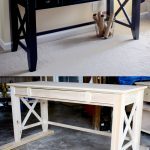 Please excuse the unfinished underside of this folding desk. I’ll get around to finishing it one of these days. Nothing to see here, folks. Move along, move along. But seriously. 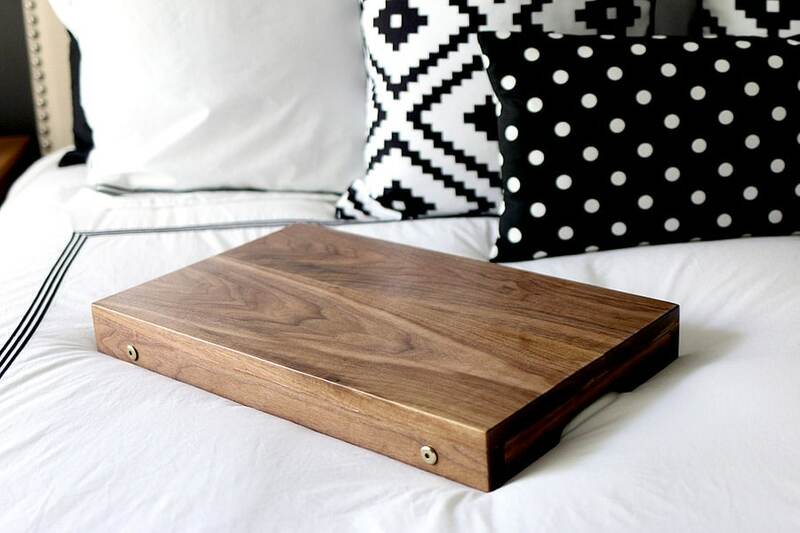 Will you just look at this gorgeous black walnut?! Gahhhh… I’m drooling. Worth. Every. Red. Cent. That is, if I’m only buying just one board. 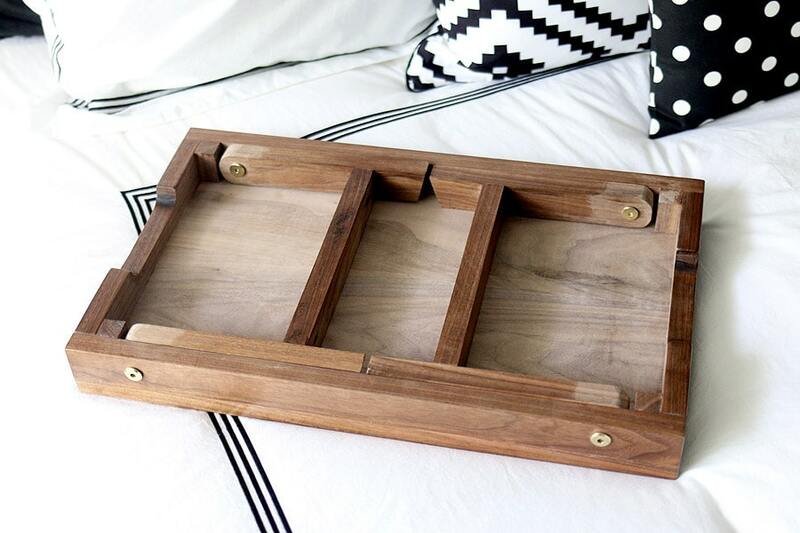 I’m not going to be building any dressers made entirely out of black walnut, that’s for sure. If you’d like to pin and share this project, feel free to use the image below. Thank you! One Board Challenge and Giveaway! Love it Jen!! The black walnut is AMAZING!!! Totally worth the splurge!! 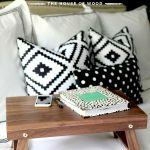 I need to make one of these…more blogging may get done if I can do it from bed…LOL!!! I love the idea for this series! 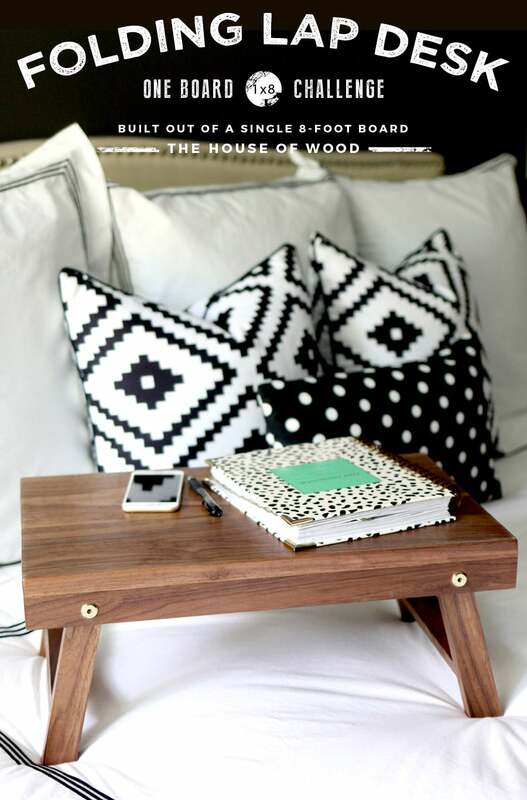 And this desk is gorgeous also and I want to build one! Thanks Alexis! Missed you at Haven! Thank you my dear. Yours too. I want to steal your Domino. I love this! It’s gorgeous! This is fantastic. Thanks for the inspiration to get somethin’ done! Oooh! I am in love with how your tray turned out, it is just beautiful. And I can think of quite a few projects around our home where that wood tone would be perfect. Thanks for sharing the Arm-R-Seal tip! Thanks Jen! I’m so happy I got to meet you at Haven. We’ll have to carve out some time to hang next time! Please notify me of new posts by email. Thanks. So classy as always. 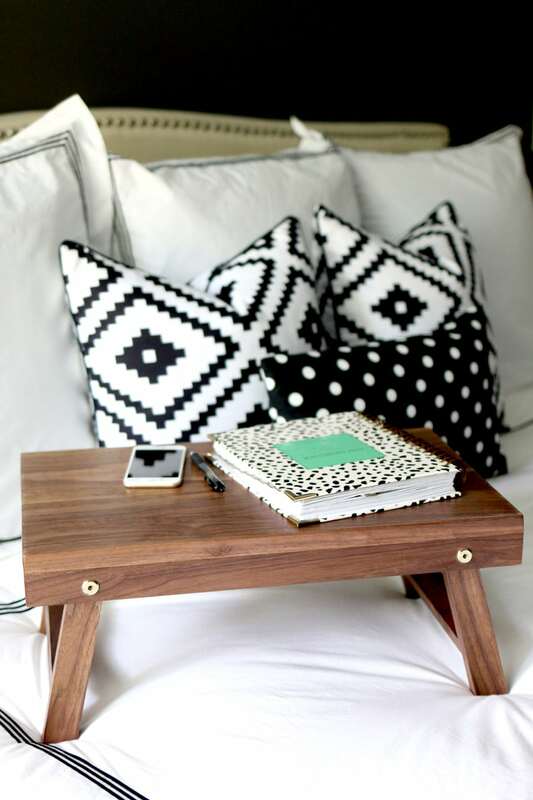 Wish the hotel had their rooms outfitted with your beautiful lap desk! Thanks Jaime! I could’ve used this in our hotel room this past weekend! This is absolutely brilliant AND beautiful, Jen! Thanks lady! So good to see you again and congratulations on winning that amazing lathe! So well-deserved. Hey I was wondering what size connecting bolts you used and if you stain as you go? I found the exact connecting bolt and cap shown here at hardware section of my local Home Depot. 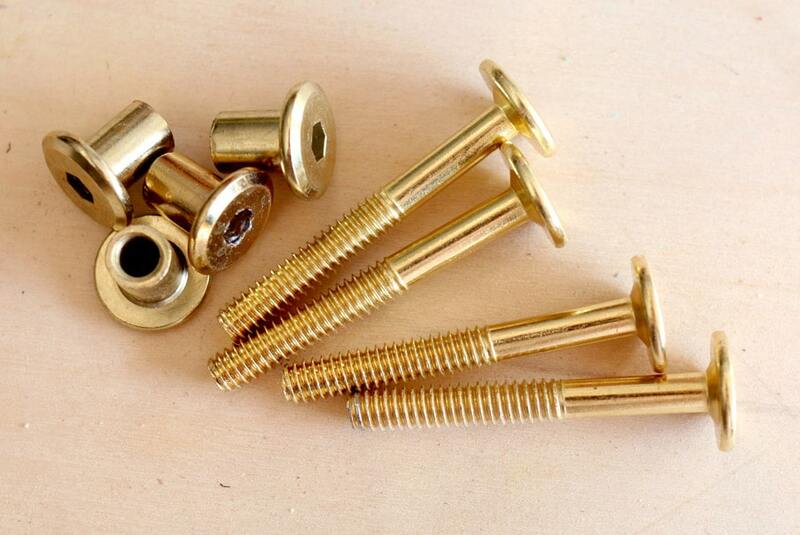 If you order online then try to find connecting bolt sized 1/4-20 (#20 bolt with 1/4″ thread) and cap should have a length of 1/2″ under head. For drilling I stacked/clamped two pieces of 3/4″ wood together then drilled a 1/4″ dia. hole through both pieces. Next I removed clamps and opened up (or enlarged) the hole on the piece that the cap would be inserted into to 21/64″. I used 1 washer under the bolt head and another washer between woods. I think staining prior to attached legs is much easier. Since I used black walnut for this project, I didn’t bother staining it because the natural wood grain and tone was so beautiful! I just finished it with the Arm-R-Seal and called it a day. Thanks for the question! I love this Jen! It’s so beautiful and functional. The color is great, but the best part, one board. My kind of project. I have never heard of the Arm-R-Seal, but if it makes a project turn out like this one, I will definitely have to try it out! For sure! You’ll have to let me know how Arm-R-Seal works out for you – it’s my new favorite finish. Good to see you again at Haven! 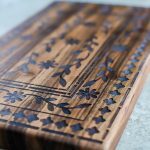 Oh that black walnut is just AMAZING!! Drool worthy! I love this project, I need one for my Mac too! Thanks for putting this challenge together Jen it has been so fun!! You have the best tutorials ever! Great pics & information. 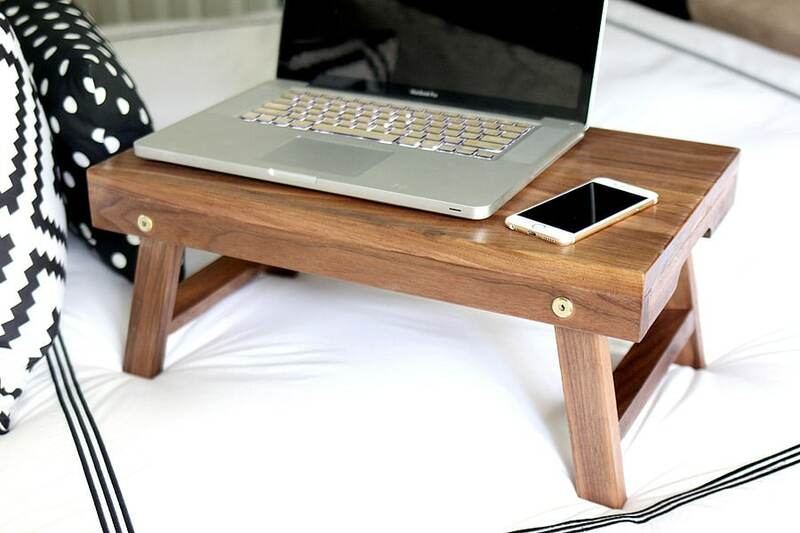 This little table is so cool, how hand this would be to have…another to do list coming up for me. Random, but I think I have an IKEA rug in my family room that matches your bed pillows, LOL. I love those pillows. Can you tell me where they’re from (not the polka dot ones, but the other ones)? Are they made from IKEA fabric? Thanks! Look forward to reading more posts. Nice tips. I love wood working, too. I often do some simple things for my family. I’ll try to do this next time. Thanks for share. I love all these beautiful ideas! Thank you for posting this! Thanks for your share Jen. I often do small things in my house as a hobby. 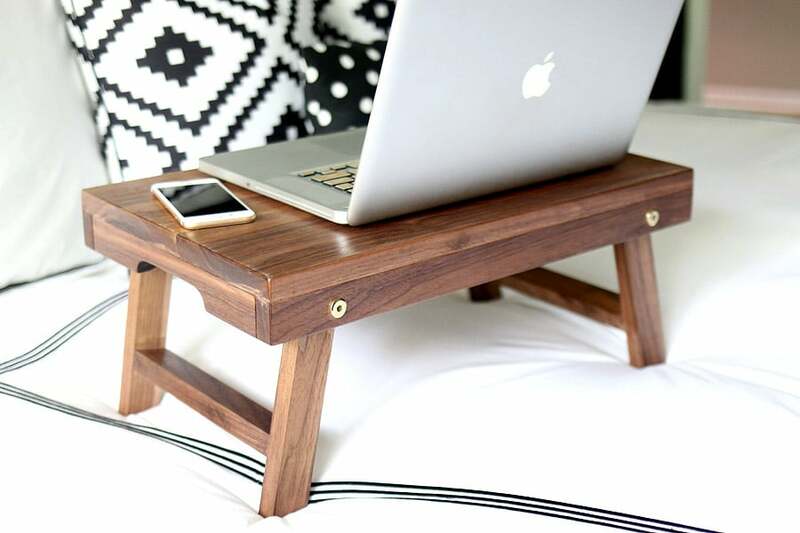 This lap desk will be the next product of mine. My husband like to make DIY project. This desk will be a great idea for him. I had a bunch of scrap 1×4″ pieces laying around, and this was a great use for them! I only have a few basic hand tools, but between my ryoba saw and my #4 hand plane, this project has been great so far! I had to tweak a couple of the measurements (given that I lost a half inch on the width of the top, since I was using 4 1x4s instead of 2 1x8s, but that was easy enough to accommodate. The stain is drying on mine right now, and I can’t wait to attach the legs! Thank you for such a fun, simple little project. I can’t wait to use it when it’s done! So awesome to hear, Rex! Thanks for taking the time to leave a note! 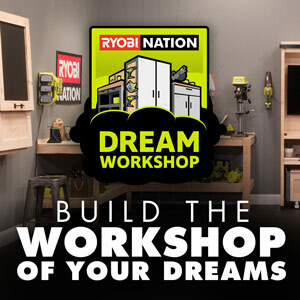 I’m a DIY enthusiast and a teacher working at a nonprofit organization. 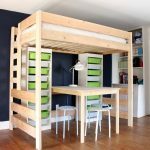 I was looking into these plans to recreate for my kids at work but on a more frugal budget. I Have changed the dimensions of the desk to be 16 inches by 24 inches. I wanted to know if I could use something a little cheaper on the Desk Top Part. My two though bunnies are to use MDF for the top or to use a 1/2 inch thick plywood for the top. I am aiming to make 24 to 30 desks total to be used by kids all day long. I don’t want a desk that will sag in the middle or get messed up in any other way. I am painting the finished product with some type of epoxy or glaze like paint. We are a nonprofit and I want to keep the cost as low as possible while still making a product that can be used for years to come. Please let me know what you think of the two alternates and any other suggestions you have for me!